Sara Toal is from Tioga, Louisiana and is a 2018 graduate of Tioga High School where she was an active member of her FFA chapter, choir, student council and speech and debate team. She competed in Land Evaluation, Livestock Judging, and Prepared Public Speaking. Sara comes from a long standing family Dorper and Hampshire sheep farm where she has worked to improve breeding efficiency and start her own operation. Sara was the state winner in the Sheep Production proficiency award area in 2018. She is now a student at Louisiana State University where she is studying biology with the hopes of becoming an Infectious Disease Specialist. 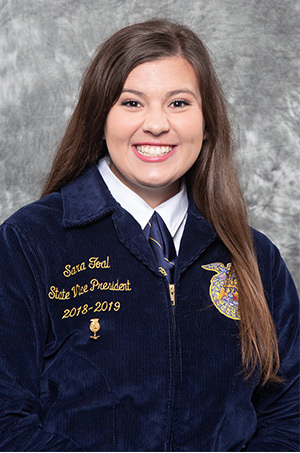 Sara Toal is proud to serve as our 2018-2019 State FFA Vice President representing Area II.